You can confirm the changes have taken place by taking a screen shot, emptying the Trash, or performing any other Finder-level task that usually had audio feedback associated with it. Of course the actions still take place, there is just no longer sound effects associated with them. This also seems to mute the Notification Center sound effect if you’re tired of hearing that one too. Muting system audio will also have the same effect, but that obviously mutes everything, and otherwise there is no way in the GUI to ditch the sound effects outside of the Preference toggle. Turning to the command line, however, does provide us with options for both dealing with Trash quietly and silently taking a screen shot. The screencapture command has a lot of other uses as well, you can read more about it here. Accompanying that trick with sudo or chflags will also forcibly empty the trash from the command line, again without audio, even in the most stubborn of situations. Thanks to @jhuckaby for defaults idea! 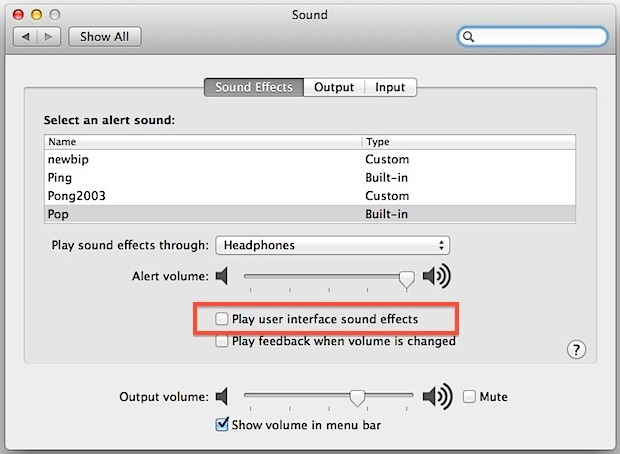 What I’d love to know, is how to disable the “Play user interface sound effects” checkbox via the command line. Meaning, which .plist file it lives in, and how to set it. (This way I can add it to my “New Mac Setup” shell scripts, hehe). fancy sharing those “New Mac Setup” scripts. They sound extremely useful! And like @James said, feel free to submit those shell scripts, they sound handy! Niiiiice the screenshot sound was always annoying to me. Thanks for the tip! Since the upgrade to Mountain Lion I have never been able to get the “empty trash” sound to work. The latest update seems to have fixed the issue and now you tell me how to disable it. LOL… funny! I kind of like it. Disabling those unnecessary sounds is one of the first thing I do after buying a new Mac of installing an operating system. I hate those sounds. My first PC ran Windows 98, but even on that PC I disabled those sounds and I did this on every PC and Mac I’ve owned. Just like disabling hiding of extensions disabling system sounds is one of the first things I do. Was able to turn my sounds off in a FLASH! In Yosemite, anyone knows how to remove annoying sound when I put a file in a folder??? I can’t do it! Help me. Thank you!